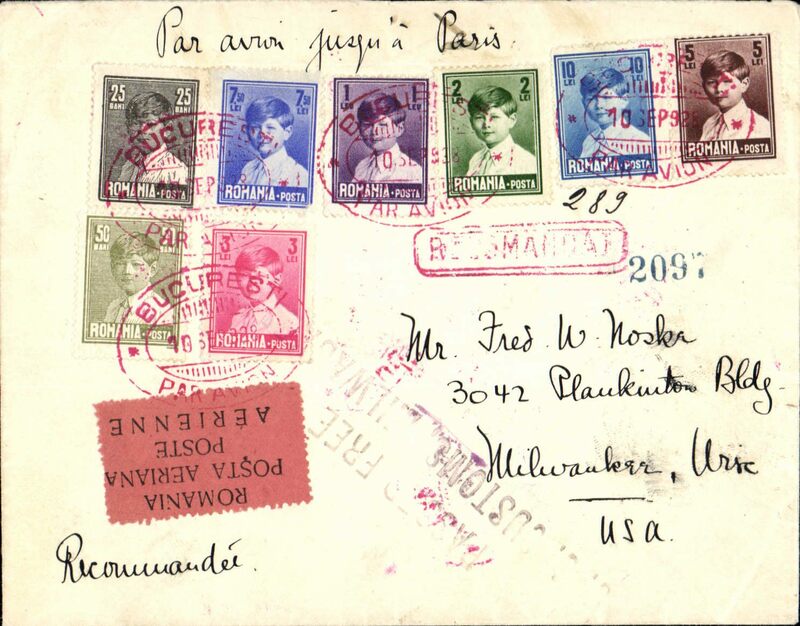 Early airmail, Romania to United States, registered cover franked 1928 King Michael set of 8, and 1928 air set of 3, canc nice srikes of red oval Bucharest/Par Avion postmark, addressed to Milwaukee, USA, b/s Milwaukee/Wisc 23/9, red rectangular framed'Recomandat' hs, black/salmon four line airmail etiquette rated rare by Mair. Nice item in very fine condition. 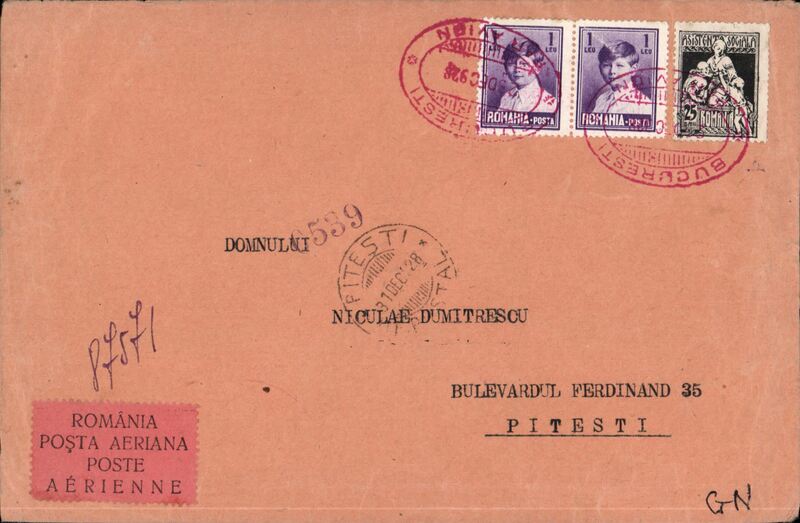 Early internal airmail, Bucharest to Pitesti, 31/12 arrival ds on front,franked 1928 air set of three (x3) on back and 2L, 25b ordinary on front, all canc with fine strike red oval Bucharest 23 Dec 1928 pmk, black/salmom bilingual airmail etiquette. 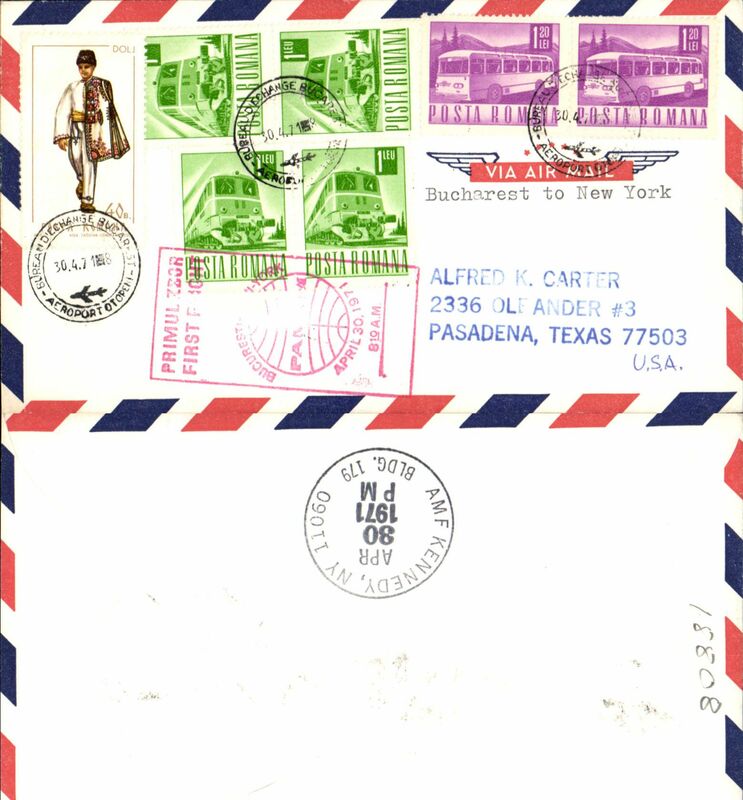 Early air cover to England, bs oval registered Tonbridge, Sussex 1.Jun.29 arrival ds, registered (hs) cover franked 1928 Air set f 3 and 1929 Union set of 6, cancelled red double ring Bucurest/Par Avion oval ds, ms "Wien-Berlin" and "Par avion", black/salmon four line etiquette rated rare by Mair. Ironed vertical crease. 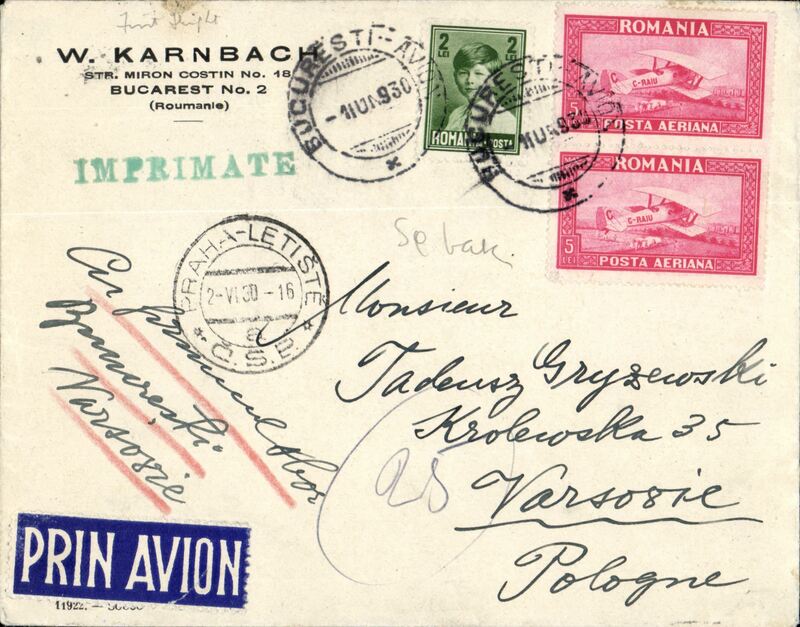 LOT, F/F Bucharest to Warsaw, bs3/6 via Prague 2/6, cover franked 12l canc Bucarest Avion cds, large violet triangular F/F cachet verso, white/blue 'Prin Avion' eiquette. 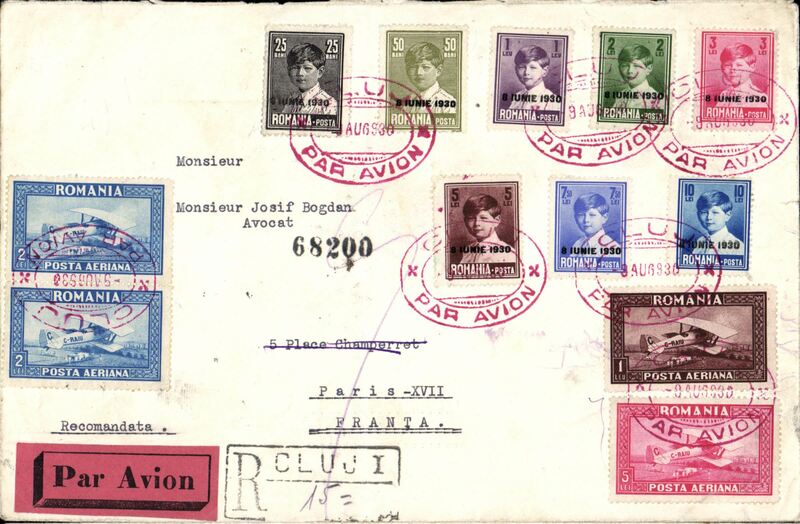 Early airmail, Romania to France, Cluji to Paris, bs 13/8, registered (label) cover franked 1928 King Michael set of 8, and 1928 air set of 3, canc nice srikes of red oval ClujiPar Avion postmark, black/salmon four line airmail etiquette rated rare by Mair. 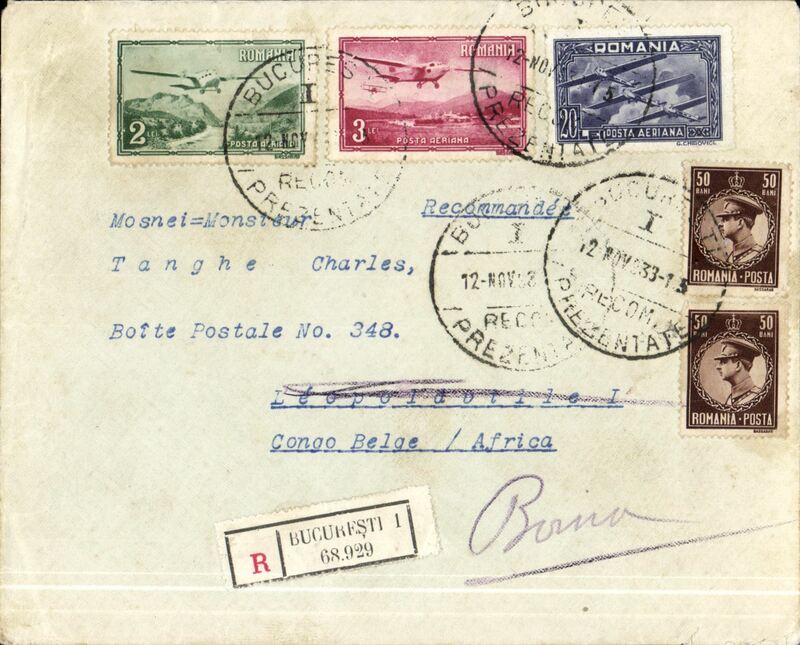 Romania to Belgian Congo, Bucharest to Boma, bs 11/12, unflown registered (label) cover, franked 26 Lei (1931 2l, 3l and 20l airs + 2x50b ordinary, canc 'Bucurest Prezentate' cds and correctly franked for a double weight surface cover to the Congo. 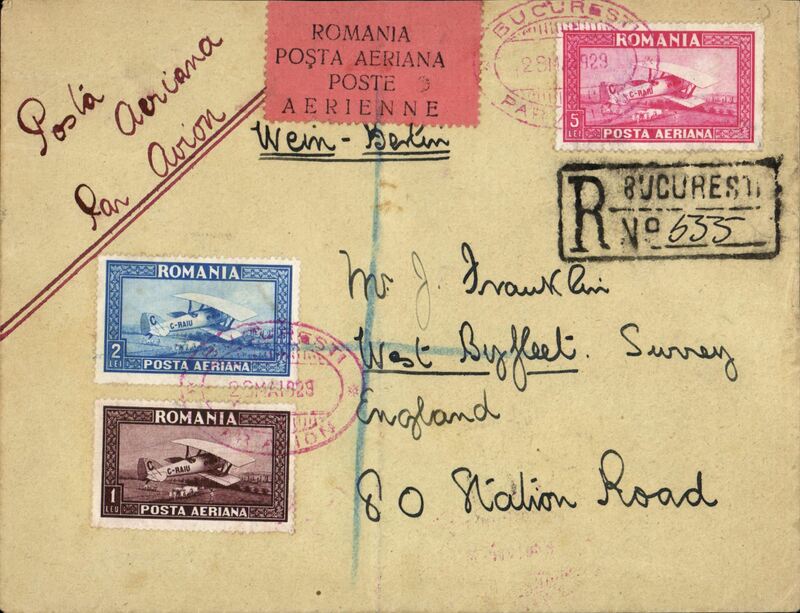 The November 1933 UPU surface rate was 10Lei for the first 29gm, then 6 Lei for each subsequent 20gm, or part thereof, and the foreign registration rate was 10 Lei.. Although not flown, this is an an unusual origin/destination combinationn, and would make a nice collateral item.